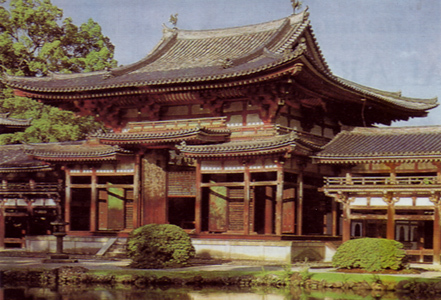 Pavilion of the Phoenix in the Buddhist temple of Byodoin di Uji, Honshu, Heian period, 11th century. The structure of the building and its roofs follows the shape of the mythical bird. In Japan, in the fourth and third centuries BC, the cultivation of rice and the transition from a nomadic existence to farming laid the foundations for the Yayoi culture, which became renowned for its pottery and metalwork. Technical proficiency in the latter field produced weapons, utensils, and necklaces and achieved particular originality in both the form and decoration of bronze bells, known as dotaku. These may have had a ritual function or symbolized fertility. The ornamentation was both geometrical and naturalistic, and the same motifs were used for decoration in red on earthenware crockery. From the third and fourth centuries ad, the kofun, large burial mounds, were the burial sites of a warrior aristocracy; this is indicated by the quantities of weapons and armour found in them. The beginning of the Asuka period (c. ad552-645) brought more awareness of Chinese culture and close diplomatic links with Korea, and it led to the adoption of writing with Chinese characters. The improvement of techniques in woodworking during the Hakuho period (ad645-710) contributed to the development of rural and religious architecture. Shintoism inspired both sacred and domestic architecture and was responsible for the sanctuaries of Ise and Izumo, dedicated to the cult of the founding divinities (kami). The arrival and diffusion of Buddhism in about the sixth century brought a swift transition from a nonanthropo-morphic art to the creation of large sculptures. These initially represented Shaka, the historic Buddha; Yakushi, the Buddha of medicine; his assistants Nikko and Gakko; and the Bodhisattva Miroku. They were followed later by Amida, the Buddha of the Western Paradise, and the Bodhisattvas Kannon and Seishi. The strengthening of political power and the unification of the nation, together with the explicit support of the new doctrine by the court, brought about a proliferation of architectural and sculptural works associated with Buddhism. The temples of the sixth, seventh, and eighth centuries observed the canons of Chinese and Korean architecture: a regular plan with pavilions on a northsouth axis, with the southern portal (nan daimon) as the main entrance, a golden hall (kondo) to accommodate the principal image of the cult, a pagoda (to), a refectory, and a reading room (kodo). In keeping with these features, the Horyuji temple (ad607) of Nara remains a valuable testimony to Chinese-influenced Buddhist architecture, as no wooden architecture of this period survives on the mainland. The Shaka Triad in the golden hall, with its stiff frontal pose, the flattening of the garment folds, and the tranquil smile, show the iconographical characteristics of the Chinese style of the northern Wei dynasty. 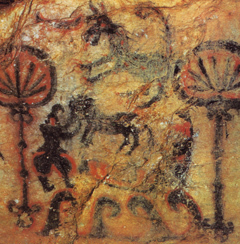 Examples of tomb paintings depict processions of men, women, and mythical animals. 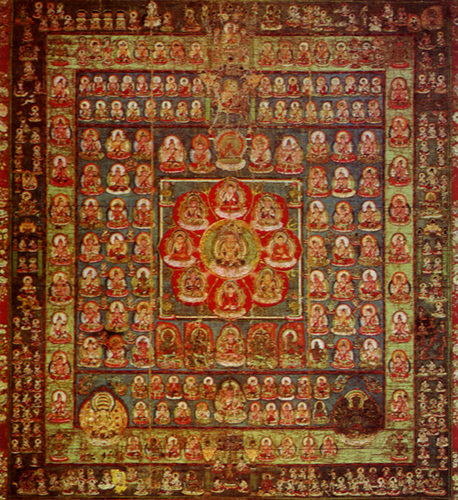 In about AD700, the wall-paintings of the Horyuji temple celebrated the greatness of Amida (Buddha of Infinite Light) and his celestial court, in a style reminiscent of Indian art. of Takeahara, Fukuoka, Kofun period. The advent of the Xara period (ad710-84) and the formation of a centralized bureaucratic state, with its "Capital of Peace'' at Heijo (present-day Nara). saw the wide diffusion of Buddhist architecture and iconography. 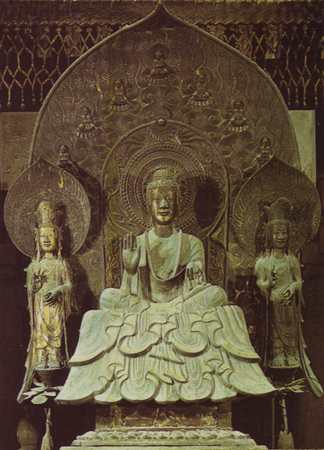 The major temples commissioned huge statues of Buddha: the Buddha of Healing (c. ad718) in gilded bronze, flanked bv two Bodhisattvas, in the Yakushiji; the smooth-surfaced bronze triad, of which only the head of Buddha survives, in the Kofukuji: the Great Buddha of Supreme Light in the Todaiji temple, the casting of which was said to have used up all of Japan's copper resources; and the Triad of Vairocana (ad759), in the Toshodaiji temple. During this period, the earliest sculptural portraiture developed, exemplified by the dry lacquer (kanshitsu) statue of the monk Ganjin. During the Heian period (ad794-1185), the excessive power of the Buddhist clergy induced the imperial court to move the capital to Heiankyo (present-day Kyoto). Town planning, while on a wider scale, retained the perpendicular grid of broad streets. The spread of esoteric Buddhism (mikkyo) and the recognition of Dainichi as the supreme Buddha led to an increased number of sculptural and pictorial subjects. Residential architecture developed the so-called shindenzukuri style, which was characteristic of aristocratic homes and featured a harmonious blend of buildings and gardens. Terracotta warrior, Kofun period, fifth to sixth century. Archaeological Museum of Aikava. Golden Room of the Horyuji temple, Nara, Asuka period, c. ad623. Descent of Amida, 11th-12th century. 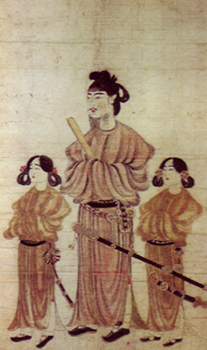 Prince Shotoku Taishi and - it is presumed - his two sons are the subjects of a painting in ink and colour on paper (c. AD684). It is a typical example of a Hakuho work, with one shoulder of each figure positioned further forward so that it is in alignment with the head. landscape that also reflects the grief for the departure of the Master. This pictorial genre, a modification of a Chinese tradition of sacred painting, employed bright colours with light touches of gold and silver in the background. The late Heian period (AD894-1185), with its fear of the Buddhist "decadence of the Law" (mappo). provided rapid impetus for the diffusion of the redeeming cult of Amida. The theme of the Descent of Amida (Amida raigo) and his celestial court — to lead the dead to the Western Paradise — became a popular source for limitless pictorial representations. The birth of a national style (yamato-e) at this time represents the establishment of a pictorial genre with secular subjects in typically Japanese surroundings, very much in contrast to the Chinese (kara-e) tradition. Perhaps the oldest work in this style is the Shigisan engi emaki of the 12th century, although the undisputed masterpiece of the genre is the Genji monogatari emaki (the illustrated scroll of the Tale of Prince Genji), an unequalled visual accompaniment to one of the greatest works of Japanese literature. Taizokai Mandala, tenth century. This painting on silk is an important Buddhist work of art.